I've been growing garlic in my garden for about three years. This year was a particularly lovely harvest. Years ago, when I started my little backyard vegetable garden, it never occurred to me that I could grow my own garlic. And then, a few years ago, I tried. As with many garden endeavours, experience teaches lessons. When I first planted garlic cloves, I didn't know that you harvested the garlic bulbs in late summer. I watched their stalks and leaves die and thought: "Well, that didn't work!" The next spring I was telling my best friend how I hadn't had success with garlic and she said that I was supposed to harvest the garlic bulbs in late summer just as the leaves started to wilt. I got off the phone with her and went out to my garden. In the raised bed where I'd planted the garlic the previous summer, there were tiny green shoots. The garlic was still there and it was alive! Had it listened to our phone conversation? I let it grow that whole second season and then harvested it in August. 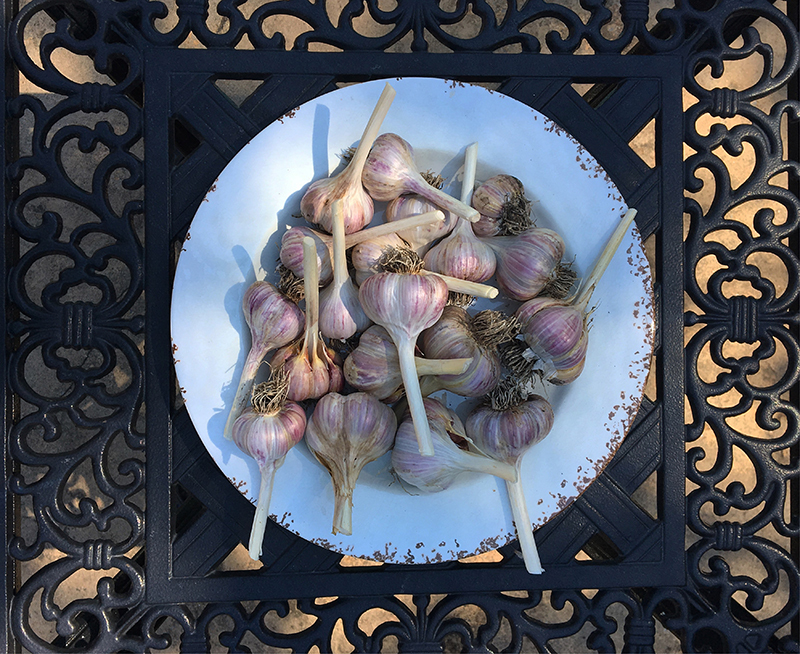 Since then, I've followed my friend's advice and have planted my cloves in the fall and harvested the bulbs in late August or early September. I cut the curly garlic scapes in the early summer and make a wonderful pesto recipe I found online a few years ago. Then I wait for the leaves to partially wilt a few weeks later and dig up the bulbs. 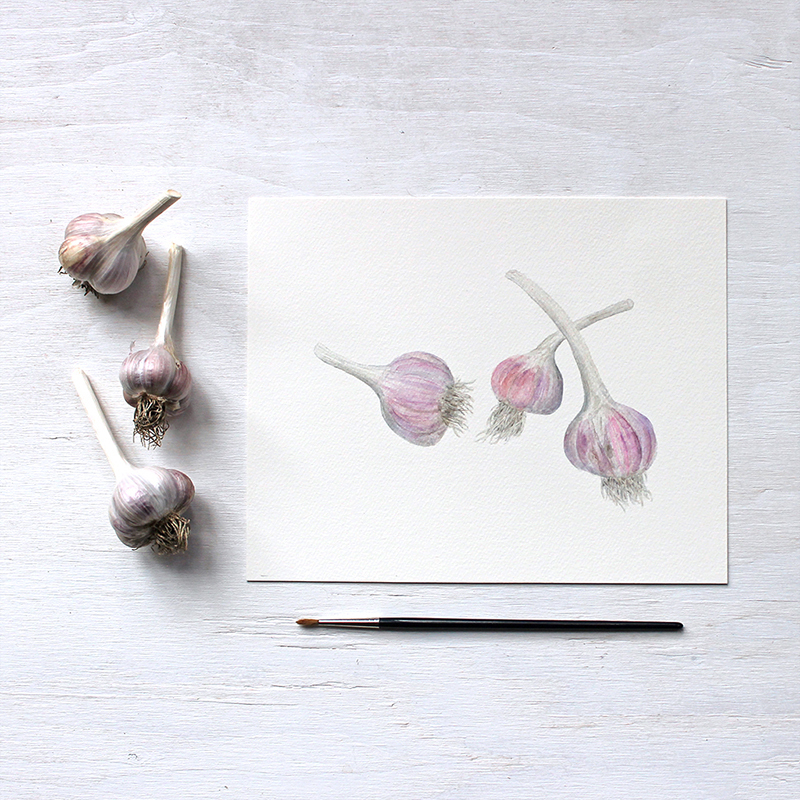 We love to cook with garlic in our household so it's a real treat to have our very own. This year, I grew Marbled Purple Stripe garlic and it is beautiful! So beautiful that it inspired a new painting! I can report that garlic bulbs are very cooperative models. They sit very patiently and don't wilt and wither like so many of my other painting subjects. They give you the time you need to admire and paint them. Here's a photo of my painting in progress. And here's the finished painting. Within minutes of posting a photo of the finished painting on Instagram last week, I received an email from a friend who has been purchasing my art for years. She had a touching request. 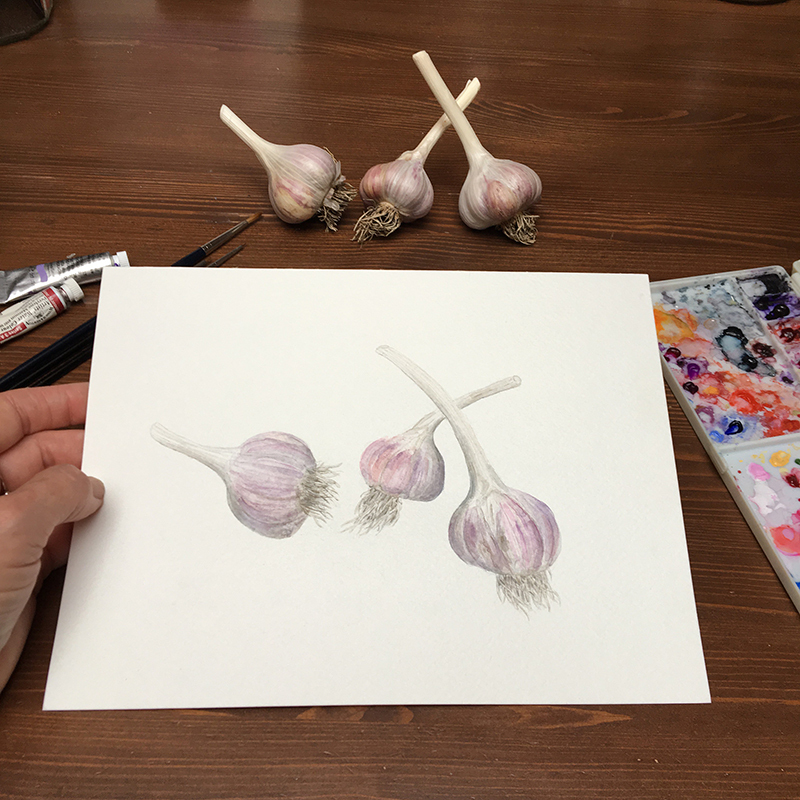 She wanted to buy a few prints of the garlic painting for a family she knows. Garlic has a very special meaning for them. 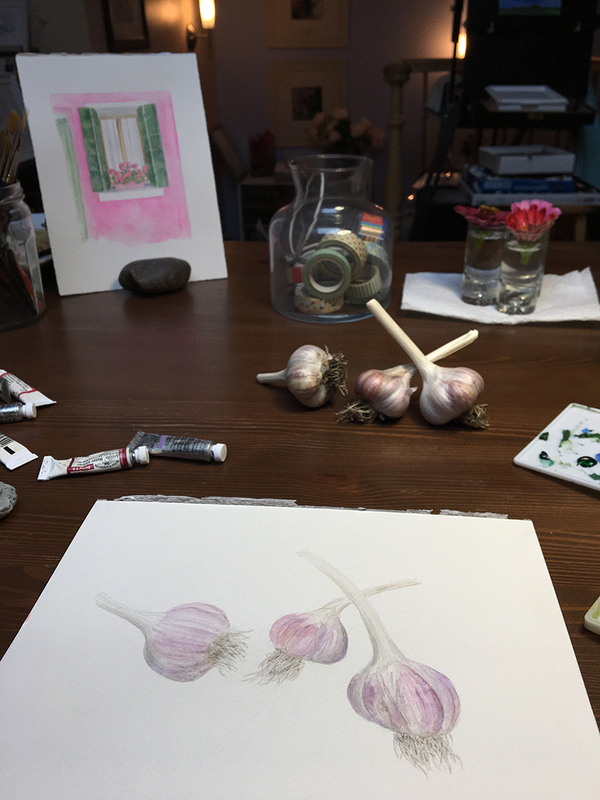 Their father, who passed away recently, used to tell his sons that a garlic bulb is like a family: while the cloves exist as individuals, they are grown together and belong to the whole. Isn't that lovely? I will always think of that now. 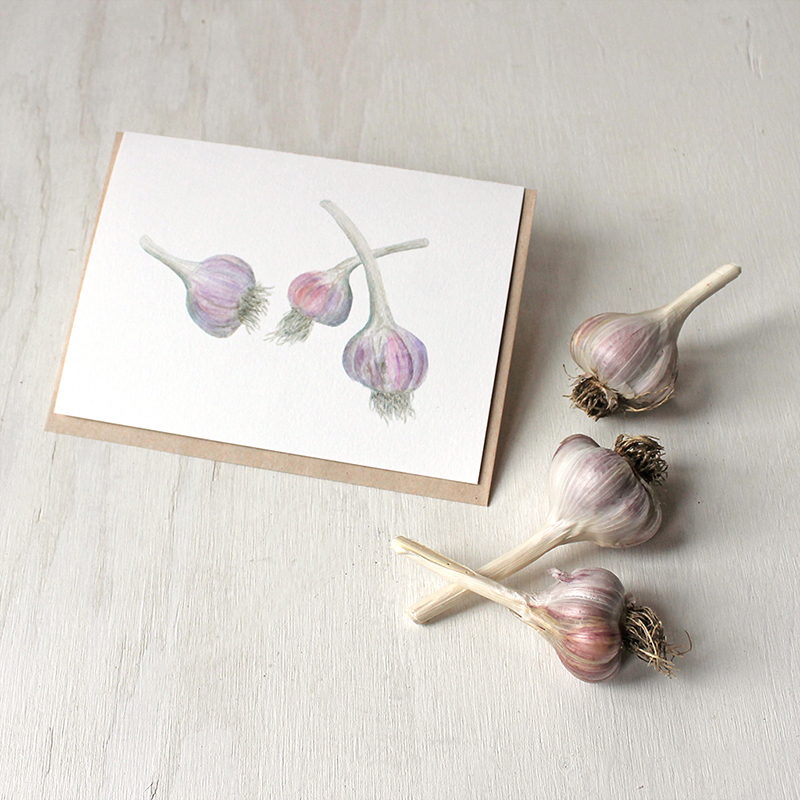 I'm happy to let you know that my garlic painting is available as both a print and note cards in my shop. Here's what they look like. * 🌱 Gardener's note: I purchased my garlic bulbs by mail from Veseys Seeds in PEI. 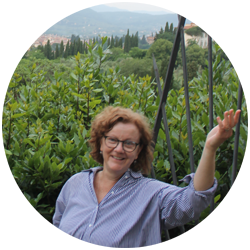 * 🍲 Cook's note: I mentioned a great garlic scape pesto recipe. Garlic scapes have a pungent flavour. I like to freeze this pesto flat in ziplock bags. Then I break off a chunk when I'm cooking a soup, sauce or stew during the winter. I also like to defrost a bit and spread it on pizza crust before adding the other toppings. Delicious! Yesterday we had twenty-four hours of I guess what you'd call a winter mix. We had freezing rain overnight, followed by some regular rain, thunder, lightning and then a bit of snow. It was quite something! Because of the dangerous icy conditions, many schools were closed in the region including Chloé's college. The power flickered many times throughout the day yesterday but we didn't lose it. Others were not so lucky. But there was a silver lining to all of that weird weather. Today, we woke up to sunshine and a sparkly wonderland. 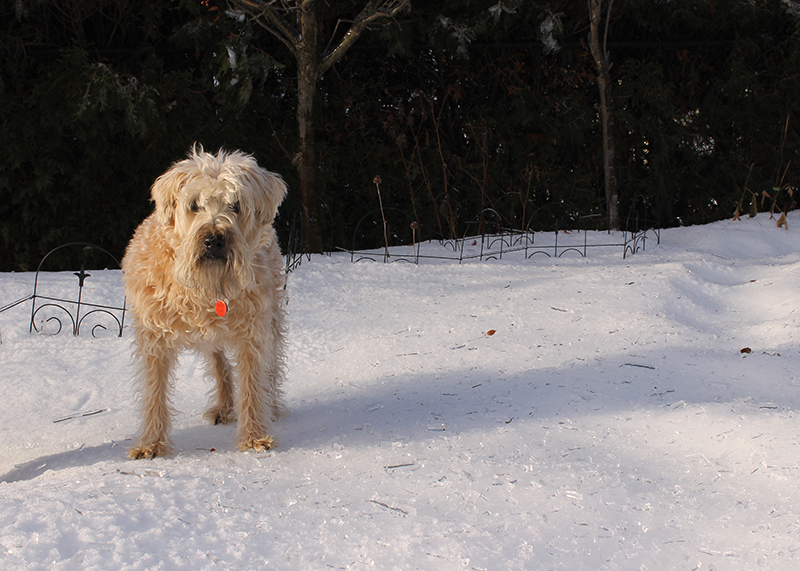 This morning I ventured outside in my boots with cleats on to take these photos in the backyard. I hope the photos give a sense of how very beautiful it was. 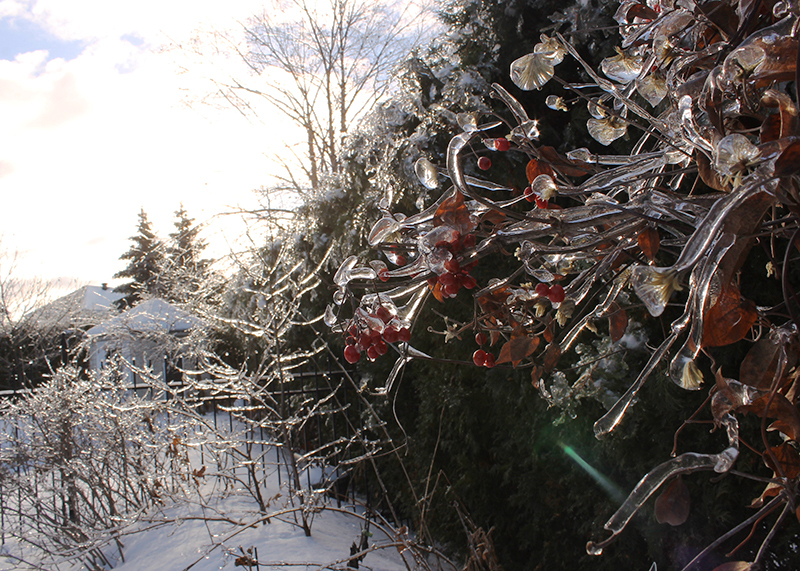 It was as if every single branch, leaf and berry was clothed in diamonds. 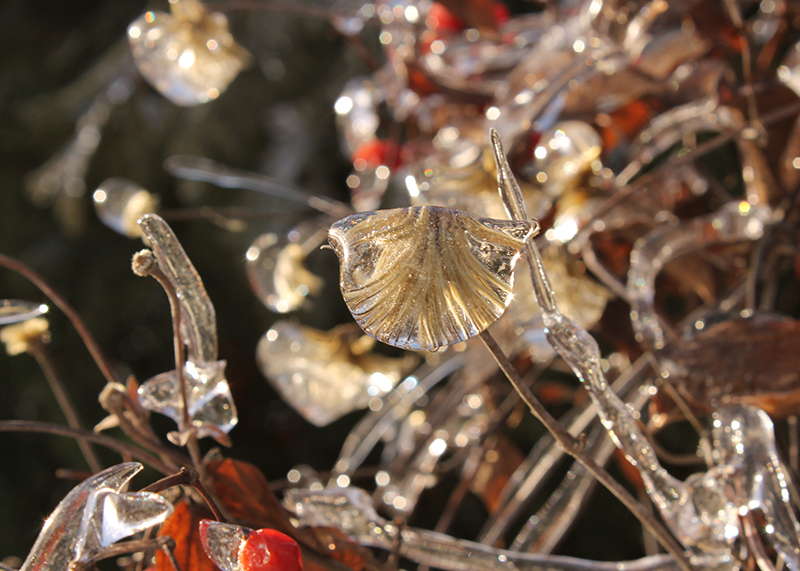 Look how gorgeous the clematis vine seed heads look encased in ice! The photo below shows you how very, very sparkly it was! 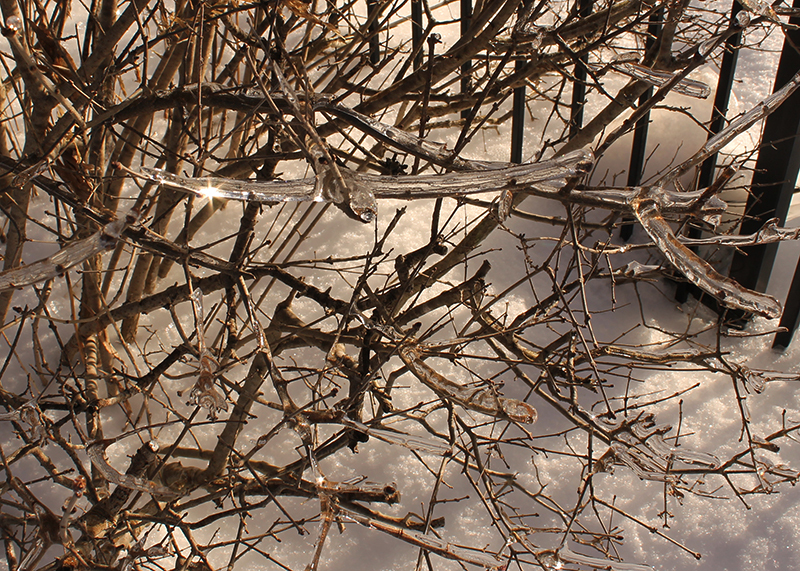 It looks like the garden is covered in fairy lights but it's the sunlight reflected in the ice on all the branches. Magical! This is one of my Palibin lilac bushes. The ice on these branches looks like a bird in flight! Meeko was able to walk on top of the ice surface. While it was slippery, he got adept pretty quickly at walking (sliding) around. He had a lot of fun exploring all corners of the yard. He's been limited lately because of how deep the snow was in places but with a covering of ice, he was able to go everywhere! My movements were a little less elegant. Because I weigh more than thirty-five pounds (! ), I broke the ice and sunk in at every step! 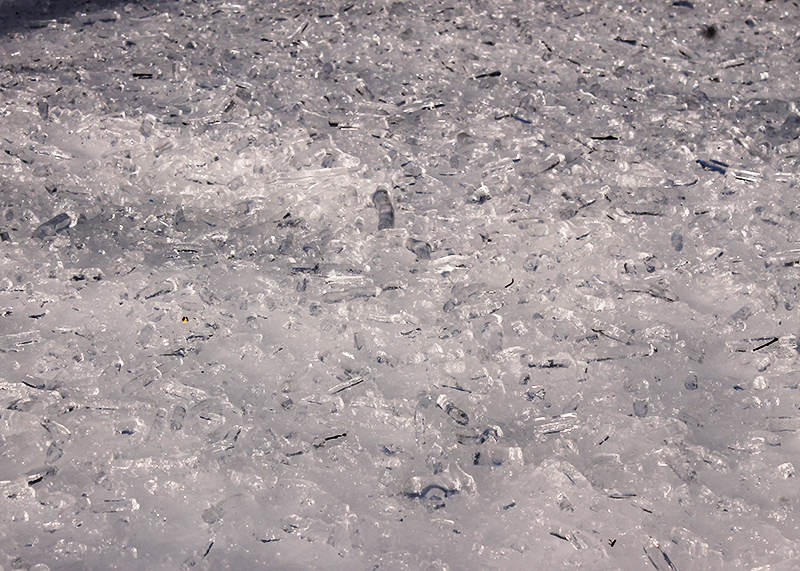 With all of the sunshine, the ice is melting. 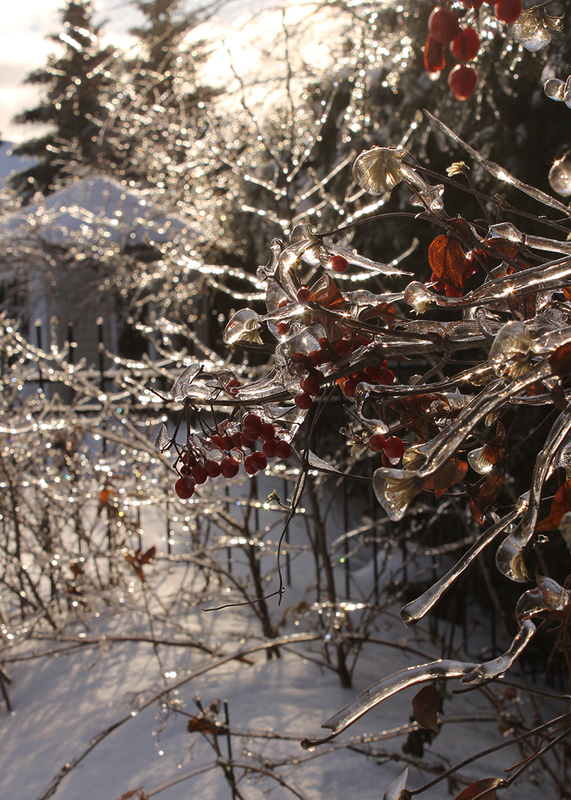 Look at all of the ice that has fallen off of the branches of our chokecherry tree! It's easy to get a little discouraged by winter weather in late January but today's icy spectacle showed that, while conditions can be sometimes be harsh, there is beauty to be found even in one's own backyard.